It’s been well documented by the likes of Steve Blank and Clayton Christensen that if you want explore disruptive innovation in a large company, you have to either redesign or create parallel processes, systems and values internally in order up to support behaviours critical to innovation — think moving fast and rapid experimentation. Failing that, taking innovation outside of the building by spinning out a company with its own processes, systems and values is par for the course. But the kicker here is to not treat the spin off as an independent startup, otherwise you might be better off simply setting up a corporate venture capital arm to invest in startups. A more powerful approach is to leverage your relative strengths to mutual benefit. A large corporate will bring domain expertise, networks, distribution channels, customers and resources to the table. The spin-off or startup will be unencumbered by reputational risk or the watchful eye of regulators which slows down corporates. It will also bring rapid experimentation, emerging tech and business models to the table. Bonus: it might prove a much more compelling workplace for emerging talent, aiding companies in their quest for talent acquisition. Together, you’ve got a formula for success. So, where to from here? No doubt you have heard of the business model canvas — a tool popularised by Alex Osterwalder and later appropriated by Ash Maurya who turned it into the lean canvas. 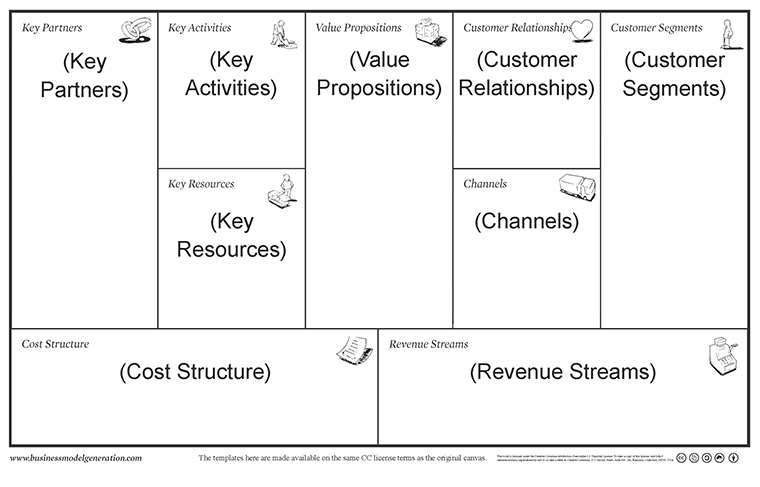 The business model canvas effectively breaks a business into building blocks such as distribution channels, customer segments, customer relationships, key partners, value propositions, resources, activities, costs and revenue models. It’s often used by startups in the early stages of building a business in place of a traditional business plan in order to get moving quickly and start testing assumptions. The canvas has also been gaining more prominence amongst corporate innovation teams. However, it has applications beyond simply mapping out a starting point for a proposed business — it can help us identify how large corporates and their spinoff entities and even startups can best work together. Step 1 — The spin-off or startup completes a business model canvas. Easy and familiar enough. Step 2 — The large company or a business unit therein completes a business model canvas (or multiple canvases for different business units). 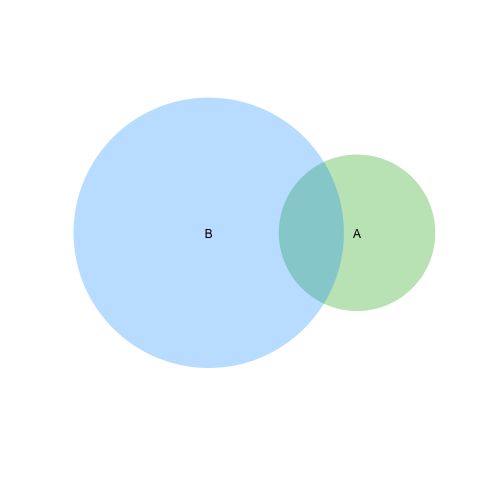 Step 3 — Map the spin-off or startup’s canvas over the corporate’s business model canvas and identify any overlaps (no dissimilar to a good old fashioned venn diagram, below). That bit in the middle — that’s where a corporate can help a spin-off or a startup. Suppose it’s 2008 and Southwest Airlines wants to diversify by exploring emerging business models in the travel industry and decides to partner with an up and coming startup from SF called Airbnb. Their respective business model canvases at the time might look a little something like this (at a very high level for simplicity’s sake). Very quickly we’ve identified a number of potential synergies. Online bookings: As a startup, it’s IT infrastructure may be ill equipped to scale and support growing traffic and demand. There may be scope to share or leverage some of Southwest’s infrastructure in this space. 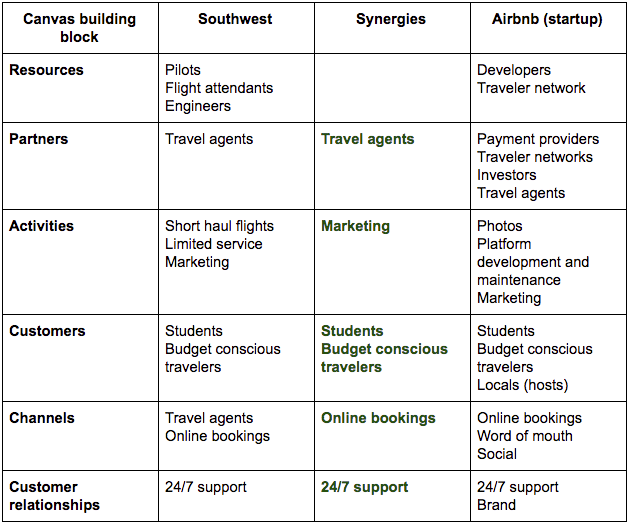 24/7 support: Notwithstanding its budget model, Southwest may or may not be able to provide some level of customer support to aid the development of Airbnb’s brand, one of its key Customer Relationship strategies. By identifying where the overlap is we can identify who in the large corporate we need to be working with to help us accelerate customer testing, leverage partnerships, increase reach and ultimately increase our chances of finding product market fit, today. The lesson here is not only to look for synergies once you’ve spun out a new company or invested in a startup, but to use this as a method to identify partnership opportunities where you can help in some fundamental way before your organisation take the plunge. This way, you’ll bring ‘smart money’ to the table and get some quick wins on the board that will help to rally the organisation around innovation efforts. When it comes to early stage innovation, companies that learn the fastest win and by taking this approach to effectively leverage synergies that a large corporate can bring, corporate spin-offs and their startup partners are far more likely to succeed.